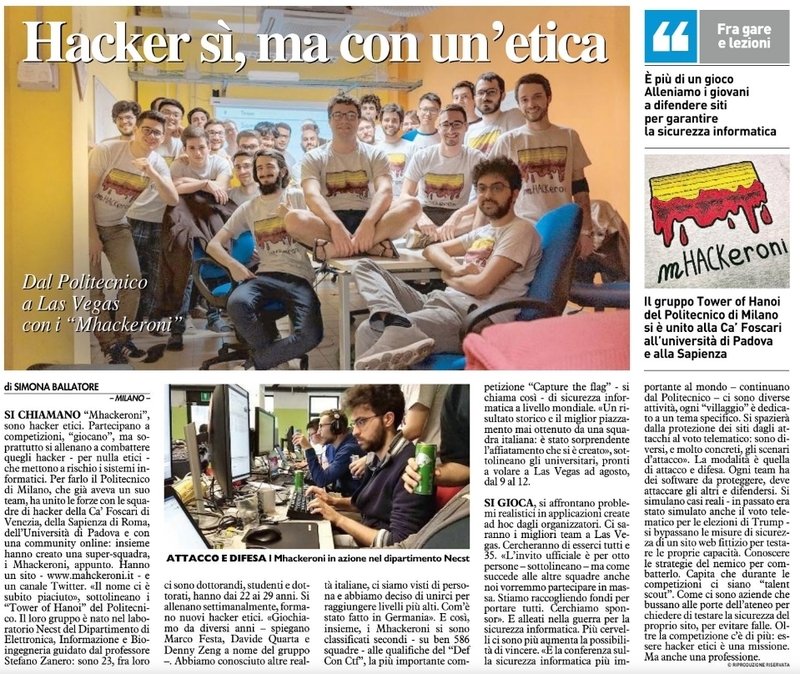 We are mHACKeroni, an Italian ethical hacking team – a joint collaboration between four major universities and their teams: Polytechnic of Milan, University of Venice Ca’ Foscari, University of Padua, and Sapienza University of Rome. On May 12-13, our “mega-team” scored second place on the DEF CON Capture The Flag qualifiers over 600 teams from all over the world. This result gained us access to the DEF CON CTF finals, on August 9-12, in Las Vegas, USA. DEF CON is the most renowned hacking and cybersecurity venue of the world. It was even featured in popular movies and TV shows such as X-Files, The Signal, and the recent Mr. Robot. DEF CON’s main highlight is surely the Capture the Flag competition, where only a handful of the best teams from academia and industry compete for glory. And this year we’ll be one of them! We therefore think that our presence in the finals is a great opportunity for visibility: last year attendees were over 25.000, and everyone’s eyes are pointed to the few competing teams. However, competing on the finals is a tremendous team effort: mHACKeroni are over 35 of the most skilled security researchers in Italian universities, and everyone’s participation is required to compete with other, similarly-sized teams. Team organization and communication are fundamental to succeed: that’s why we need financial help and sponsors to get the whole team to Las Vegas. What we can offer in exchange is the great visibility of supporting a DEF CON CTF finalist team. Silver - We’ll feature you on our social networks; people on the DEF CON game arena will put your sticker on their laptop. Gold - Everything in Silver, plus a small logo on our t-shirt. We’ll send you the CVs of every team member: BSc, MSc, PhD, and postgraduate students in cybersecurity. Platinum - Everything in Silver, plus logo on our hoodie. We’ll send you the CVs of every team member: BSc, MSc, PhD, and postgraduate students in cybersecurity. Università Ca’ Foscari Venezia: https://www.unive.it/..
Università La Sapienza Roma: https://www.uniroma1.it/it/notizia/..
Il Giorno: Hacker sì, ma con un’etica - Dal Politecnico a Las Vegas con i “Mhackeroni” https://www.ilgiorno.it/milano/..